In the illustration shown above, identify which LED/photodetector pairs represent the MSB (Most Significant Bit) and LSB (Least Significant Bit) of the binary output. Also, identify which direction the wheel must turn in order to produce an increasing count. Note: assume that the darkest areas on the illustration represent slots cut through the disk, while the grey areas represent parts of the disk that are opaque. I'll let you figure out the MSB, LSB, and up-count direction on your own! It isn't difficult to do if you have mastered counting in binary. Ask your students to brainstorm possible applications for rotary encoders. Where might we use such a device? Also, ask them to contrast the two encoder types (1 bit versus 3-bit) shown in the question. What applications might demand the 3-bit, versus only require a 1-bit encoder? 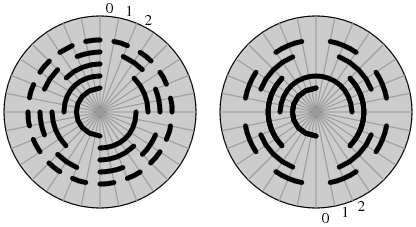 Assuming that the darkest areas on the illustration represent slots cut through the disk, and the grey areas represent parts of the disk that are opaque, mark the "zero," öne," and "two" sectors on each disk. Ask your students what patterns they notice in the Gray code sequence, as compared to the binary count. What difference do they see between binary and Gray code, analyzing the bit transitions from one number to the next? Explain why Gray code is often used in rotary encoders rather than binary coding. What difference does it make what type of code we use to mark the sectors of an encoder disk, so long as each sector possesses a unique number? Gray code markings are more tolerant of sensor misalignment than binary markings, because there is no need for perfect synchronization of multiple bit transitions between sectors. This is perhaps the most important reason for using Gray code in encoder marking, but it is not necessarily obvious why to the new student. I found that making a physical mock-up of a binary-coded wheel versus a Gray-coded wheel helped me better present this concept to students. Those students with better visualization/spatial relations skills will grasp this concept faster than the others, so you might want to solicit their help in explaining it to the rest of the class. There are many textbook references for the conversion process between binary and Gray code. Let your students research how the conversions are done! A nearly universal standard for representing text data in digital form is the ASCII code. What does the acronym ÄSCII" stand for, and what is the format of this code? ÄSCII" = American Standard Code for Information Interchange. Basic ASCII is a seven-bit binary code capable of representing all alphabetical characters used in the English language (upper-case as well as lower), as well as Arabic numerals, English punctuation marks, and some miscellaneous control codes for teletype machines. Challenge question: although ASCII technically requires only 7 bits, a full 8 bits (1 byte) is usually reserved for each ASCII character in computer systems. Explain why. ASCII is arguably the lingua franca of the digital world. Despite its humble beginnings and Anglo-centric format, it is used worldwide in digital computer and telecommunication systems. Let your students know that every plain-text computer file is nothing more than a collection of ASCII codes, one code for each text character (including spaces). I'll let you decode this message on your own! This question provides students with practice using an ASCII reference table. Explain why Binary Coded Decimal (BCD) is sometimes referred to as the "8421" code. Why is this code used at all? BCD uses groups of four binary bits to represent each digit of a decimal number. The LSD place weights are 8-4-2-1, while the next significant digit's place weightings are 80-40-20-10, and so on. Follow-up question: the four bits used for each BCD character could be called half of a byte (8 bits). There is a special word for a four-bit grouping. What is that word? Discuss with your students the purpose of using BCD to represent decimal quantities. While not an efficient usage of bits, BCD certainly is convenient for representing decimal figures with discrete (0 or 1) logic states. Nothing but straightforward conversions here! Explain how the Morse Code resembles ASCII in structure and purpose. Morse Code is digital, being composed of only two types of characters, just like ASCII. Also, its purpose is to convey alphanumeric information, just like ASCII. An interesting point to bring up to students about Morse Code is that it is self-compressing. Note how different Morse characters possess different "bit" lengths, whereas ASCII characters are all 7 bits each (or 8 bits for Extended ASCII). This makes Morse a more efficient code than ASCII, from the perspective of bit economy! Ask your students what ramifications this ßelf-compressing" aspect of Morse Code would have if we were to choose it over ASCII for sending alphanumeric characters over digital communications lines, or store alphanumeric characters in some form of digital memory media. Standard ASCII codes are seven bits in length, but communications equipment usually sends data in eight-bit (byte) groups. The extra bit is often used as a parity bit. What is the purpose of a "parity bit," and how is it used? "Parity bits" are used as a primitive form of error detection. Communications equipment making use of parity for error detection may either be configured for ëven parity" or for ödd parity". I'll let you research and explain how parity bits are used in the transmission of ASCII data. The concept of parity is not very complex. It should be well within the reach of students to research on their own and report their findings to the class as a whole.